Fresh off the heels of CinemaCon, WonderCon is now in full affect, and those attending the Anaheim convention got a big surprise from Warner Bros., as they showed off the final trailer for King Arthur: Legend of the Sword. 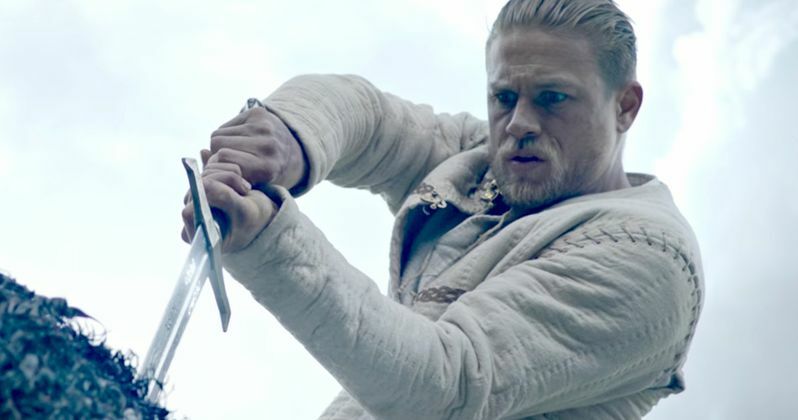 Coming from Warner Bros. Pictures and Village Roadshow Pictures, this latest footage shows Charlie Hunnam as the iconic knight as he learns how to properly swing the legendary sword excalibur. King Arthur rides into theaters In 3D and 2D on May 12, 2017 directed by Guy Ritchie, the man behind the very popular Sherlock Holmes franchise starring Robert Downey Jr. He is working from a screenplay that he helped craft alongside Joby Harold and Lionel Wigram. This version of the often told tale comes from David Dobkin and Joby Harold. It is produced by Akiva Goldsman, Joby Harold, Tory Tunnell, Steve Clark-Hall, Guy Ritchie, Lionel Wigram. Executive Producers are David Dobkin and Bruce Berman. Charlie Hunnam leads a cast that also includes Astrid Bergès-Frisbey, Djimon Hounsou, Aidan Gillen, with Jude Law and Eric Bana. The fantasy action adventure allows acclaimed filmmaker Guy Ritchie to bring his dynamic style to the epic retelling of this ancient lenegd. Starring Charlie Hunnam in the title role, the film is an iconoclastic take on the classic Excalibur myth, tracing Arthur's journey from the streets to the throne. When the child Arthur's father is murdered, Vortigern (Jude Law), Arthur's uncle, seizes the crown. Robbed of his birthright and with no idea who he truly is, Arthur comes up the hard way in the back alleys of the city. But once he pulls the sword from the stone, his life is turned upside down and he is forced to acknowledge his true legacy...whether he likes it or not. Warner Bros. Pictures presents, in association with Village Roadshow Pictures, a Weed Road/Safehouse Pictures Production, a Ritchie/Wigram Production, a Guy Ritchie film. Slated for release this summer, the film will be distributed in North America by Warner Bros. Pictures, a Warner Bros. Entertainment Company, and in select territories by Village Roadshow Pictures. King Arthur and his knights are going up against a stacked slate at the early summer box office, and are going to have to fight hard to take home the crown. It will be going up against 20th Century Fox's Snatched, starring Amy Schumer and Goldie Hawn, and High Top Releasing's Lowriders, starring Eva Longoria and Demian Bichir. It also falls between Marvel's Guardians of the Galaxy Vol. 2 on May 5 and 20th Century Fox's Alien: Covenant on May 19. So, as you can see, that's a lot of action happening at the local cinemaplex. But those round table charter members shouldn't worry. The combined talent of fan-favorite Charlie Hunnam and action maestro director Guy Ritchie should make this a must-see for a lot of folks trying to beat the heat with a little bit of air conditioned excitement. You can take a look at the latest footage, and see for yourself. There hasn't ever been a King Arthur quite like this.